It’s very easy to damage your Alloy Wheels. And nowadays most manufacturers opt to have all there Alloys Diamond Cut. This means if you kerb a wheel, it can only be refurbished on a CNC large and not by a mobile debt repairer. At Crystal Alloys, we take pride in our workmanship and finish. The look on customers faces when they come to collect there car, once we’ve Diamond Cut their Alloys is one of amazement. Most of the time they can’t believe it’s the same wheel! Each wheel is carefully prepped using quality products to remove road film, grease and tar. Then the measuring of the alloy on our CNC machine can begin. Once measured by our Technician, the cutting process can begin. This part of the refurb can only be done by our highly skilled technician. Carefully skimming a tiny amount of alloy off the wheel until all the damaged areas have disappeared. Once the cutting has ended, it’s taken to our oven to be heated before a special lacquer is applied to seal the diamond cut and prevent contamination. Whether your diamond cut Alloy wheels are from a VW, Audi, BMW, Porsche, Range Rover we can have them diamond cut looking stunning in no time at all. 24 hours is all we usually need. Your wheels will first be blasted with fine beading to clean any debris, grit or road film. Then clean thoroughly. 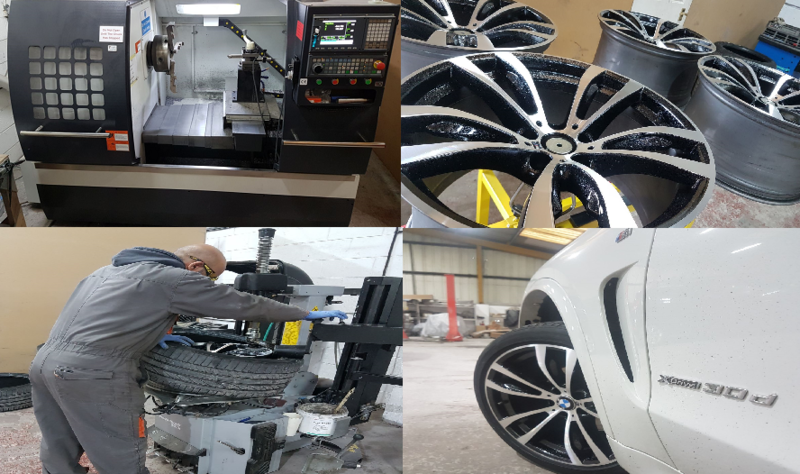 Your alloy wheel is then placed in our Diamond Cutting CNC machine. Measured to make sure the length and design of the wheel is stored into the memory. Finally your alloy wheel is ready to be diamond cut. Once our technician is happy with the final finish, is then placed in our oven for lacquering to give it a final finish and protect it from the elements. We employee highly trained staff who understand diamond cutting and are able to re-cut wheels that others may not be able to. Our skilled technicians are constantly monitoring the wheel whiles it being diamond cut to make sure the finish is close perfection. We pride ourselves on our workmanship and the tooling used in order to bring about the best results. Our service level and feedback is very important to the team. We’ll always go the extra mile to make our customers completely satisfied. We have a large facility for Diamond cutting alloy wheels. A large car park caters for all our customers cars. And those wheels that are not ready, we’ll bring all those cars in overnight to keep safe inside our unit. We have a number of ramps for customers who find it easier to drop there cars off. We use the industry leading Hoffman tyre changer & balancer to safely remove tyres and replace once a wheel have been diamond cut.